It is great to see Indian government public departments increasingly making use of technology to bring various services to end consumers. DIMTS or Delhi Integrated Multi-Modal Transit System, an equal equity joint venture of Govt. of NCT of Delhi and IDFC Foundation, has launched an Android App that promises to make Delhi Bus transportation more smoother and reliable experience for commuters. 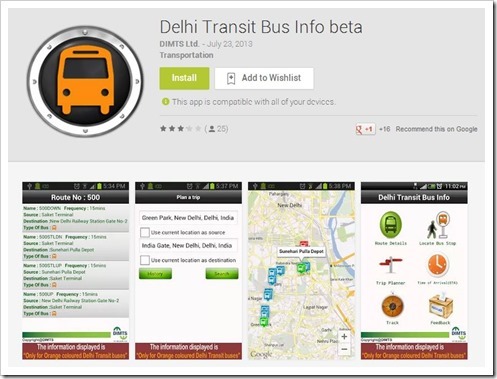 The App aptly called “Delhi Transit Bus Info beta” offers bus commuters various features which include Route details, Bus stop locations, Bus timings and their estimated times of arrival. Not only that commuters can also track the buses through their route. Though the app is quite simple, this could prove to be extremely useful to commuters especially for the visitors who are new to Delhi. The app also features “trip planner” where user can put his starting location manually or through mobile’s GPS along with the destination. The app will then provide with the full trip details as to which bus route needs to be taken and the bus stops commuter will need to board the bus and get off. Prima Facie the app looks quite good. We downloaded the app and tried out various features. The app works well, but is currently available only for some routes. According to the description given on the application page, the app is currently available only for orange coloured Delhi Transit buses. However, incase of trip planner all DTC routes are included. Google Bus transit is also another reliable source which commuters can use to get more information on Bus routes and their timings. Being a feature of Google Maps, it can also easily find you own location and suggest your boarding and destination bus stops. However, because DIMTS themselves have developed this app, “Delhi Transit Bus Info beta” could be termed as the Official Delhi Bus Transit App that will have the most updated and authentic info, which is very important for commuters, especially the first timers who completely rely on these kind of apps. If you are in Delhi, give this app a spin and do let us know what you think about this app! Andhra Pradesh Most Popular Domestic Tourism State, Maharashtra For Foreign Tourists!